The index opened up around 8729 and stayed positive throughout the entire day of trade, making higher highs with each passing hour to close near the top at 8844.60, huge gain of 160.75 points. The broader market was also strong, with 1078 advances to 420 declines. 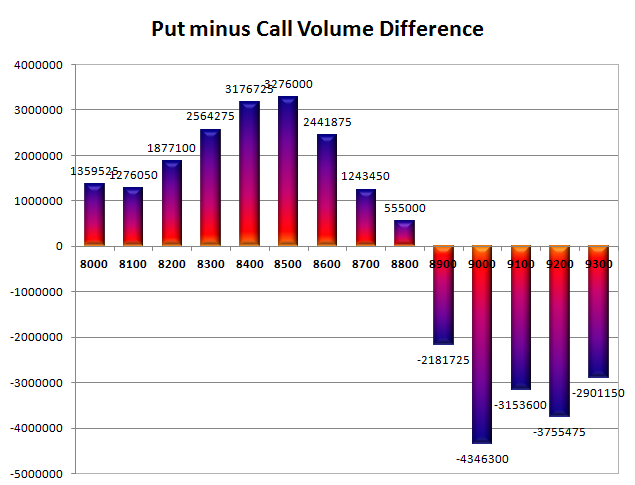 Developing Range as per Option Table at start of series comes to 8500-9000. 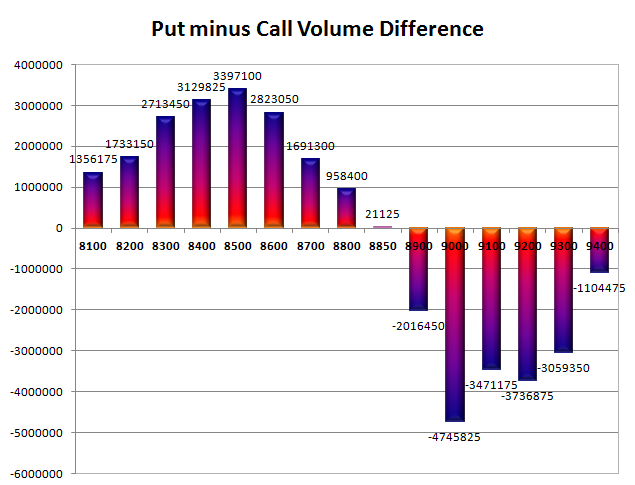 Call option 8800-9400 added huge 48.06 lacs OI with small short covering seen at 8700 strike price. 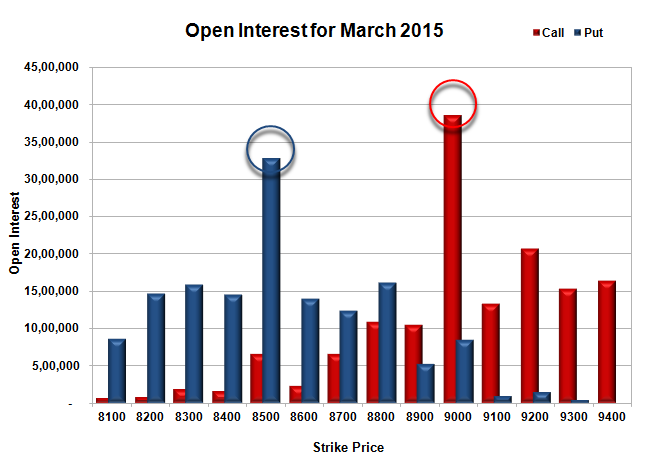 Put option 8900-8100 added huge 37.33 lacs OI with not much change at other strike prices. 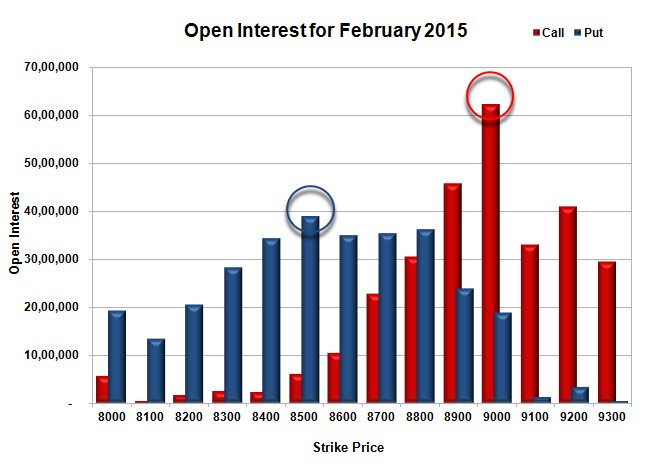 Nifty Open Interest is at 2,41,92,825 up by 2,08,000, with increase in price, most probably huge long build-up. 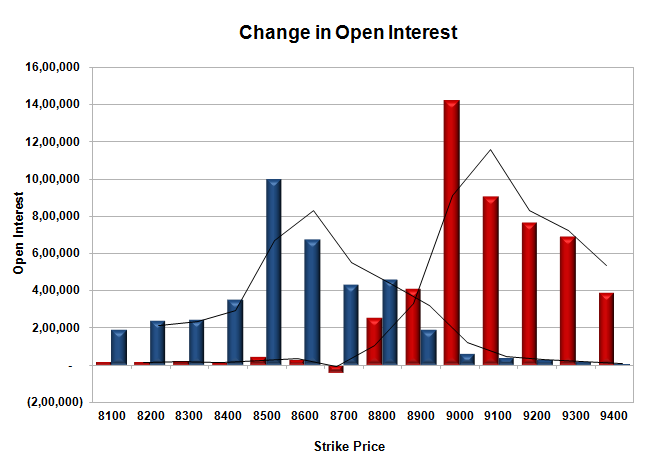 Bank Nifty Open Interest is at 19,97,100 down by 60,075, with increase in price, most probably huge short covering. FII’s bought huge 11.44 lacs Futures, which includes 35219 contracts long build-up and 10533 contracts short covering, with increase in net OI by 24686 contracts (includes 111594 longs to 65842 shorts for the day) and the Average Price comes to 8840.08. 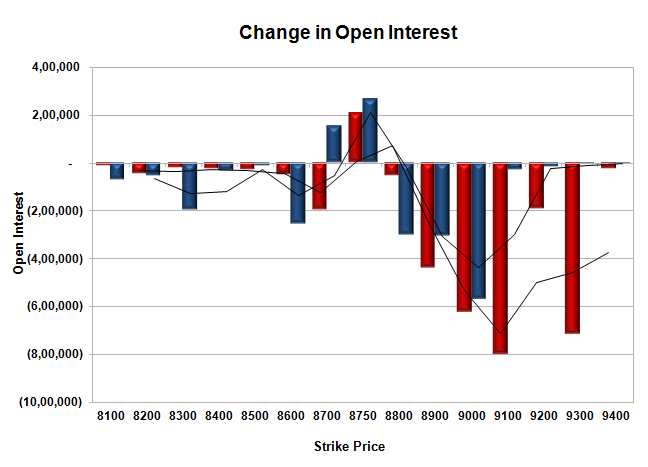 FII’s Index future open contract as on date is 724206 Longs to 111084 Shorts, net long 613122 up by 45752 contracts. 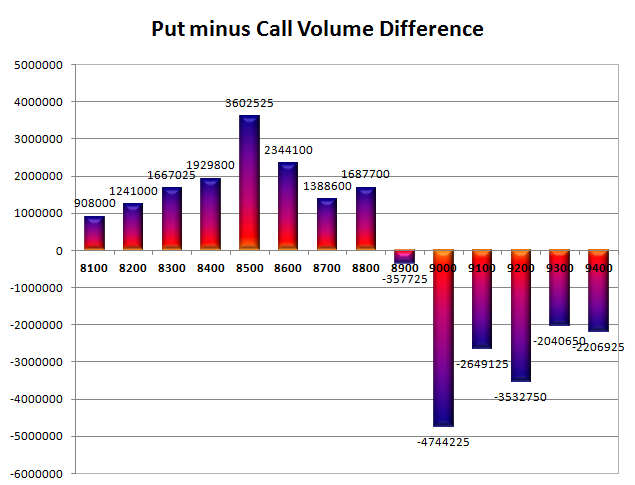 Initial and best support at 8500, with OI of 42.70 lacs. Initial and best resistance at 9000, with highest OI of 52.79 lacs. 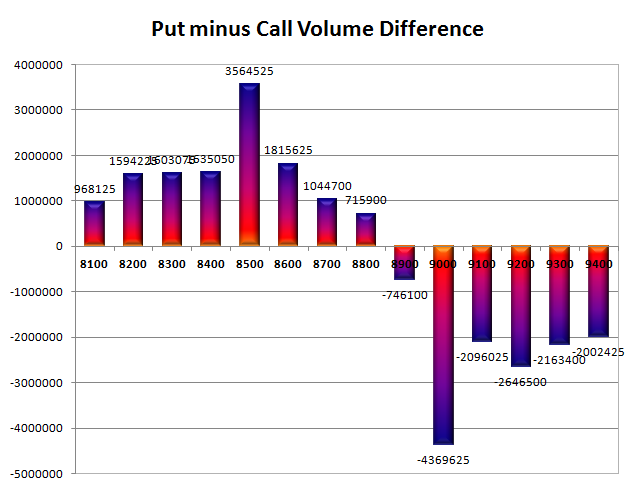 Day Range as per Option Table is 8733 - 8899 and as per VIX is 8754 - 8935 with 8806 as the Pivot. The index opened positive at 8773 but stayed within the narrow range of 8700-8800 and closed flat at 8762.10, small gain of 7.15 points. The broader market though was weak, with 551 advances to 941 declines. 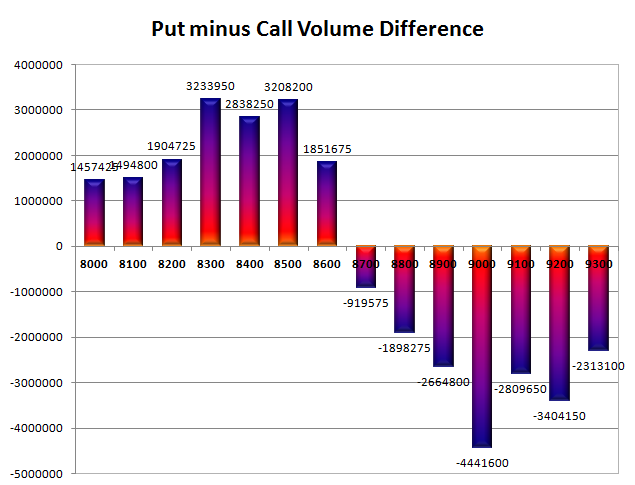 Range as per Option Table comes to 8500-8900. 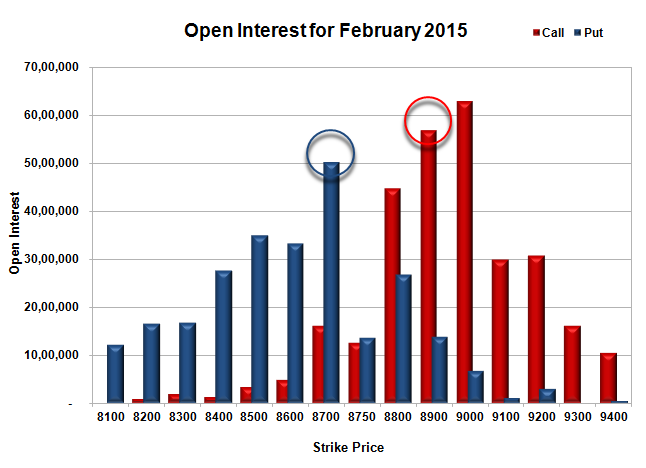 Call option 8750 added 2.07 lacs OI with profit booking seen at 8900 and above strike prices. 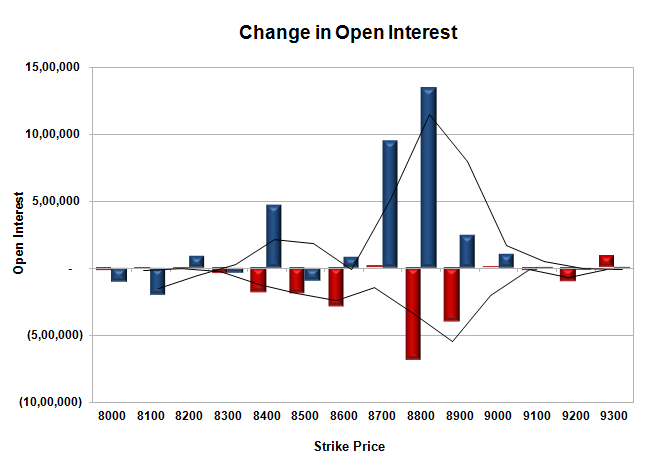 Put option 8750-8700 added 4.20 lacs OI with short covering seen at 8800 and above strike prices. 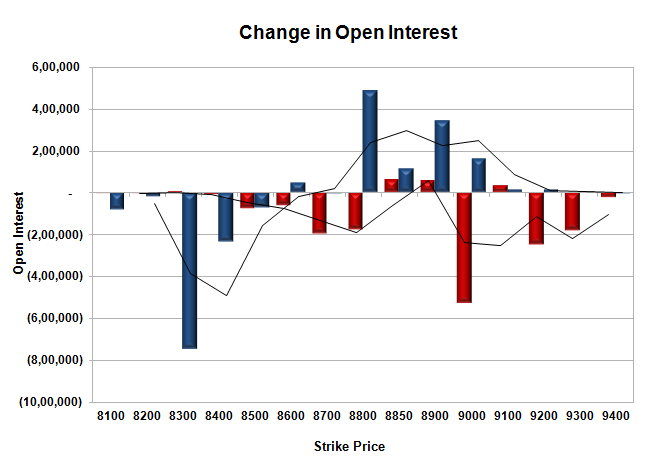 Nifty Open Interest is at 1,26,98,450 down by 38,24,925, whereas March series added 51.18 lacs with small increase in price, mostly rollover with long build-up. Bank Nifty Open Interest is at 19,81,350 down by 2,53,325, whereas March series added 2.55 lacs with decrease in price, most probably 100% rollover. 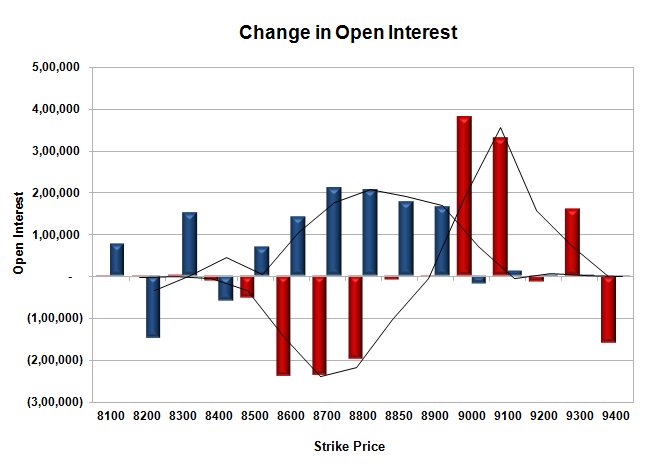 FII’s sold 1.97 lacs Futures, which includes 42518 contracts long build-up and 50381 contracts short build-up, with increase in net OI by 92899 contracts (includes 304349 longs to 312212 shorts for the day) and the Average Price comes to 8883.34. 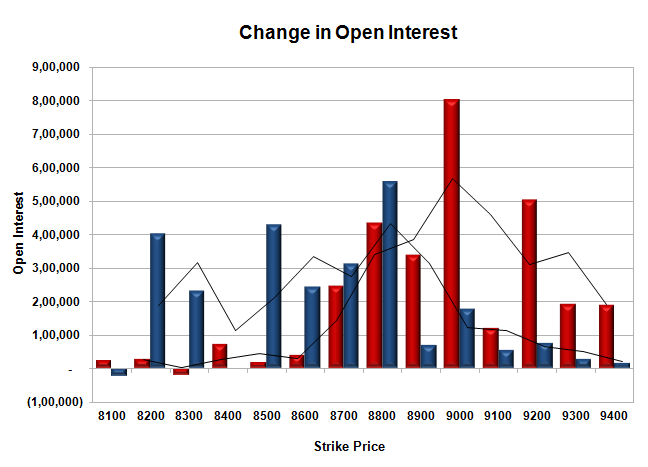 FII’s Index future open contract as on date is 786849 Longs to 173532 Shorts, net long 613317 down by 7863 contracts. 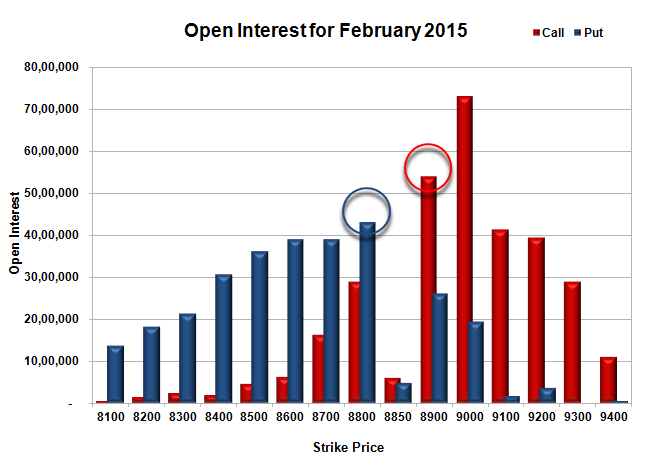 Initial and best support still at 8700, with OI of 44.96 lacs and below that at 8600 with OI of 30.62 lacs. 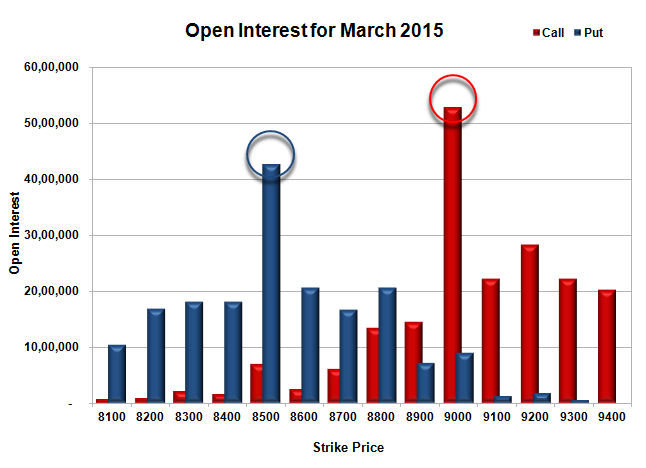 Initial resistance at 8800, with OI of 39.49 lacs and above that at 8900 with huge OI of 57.32 lacs. 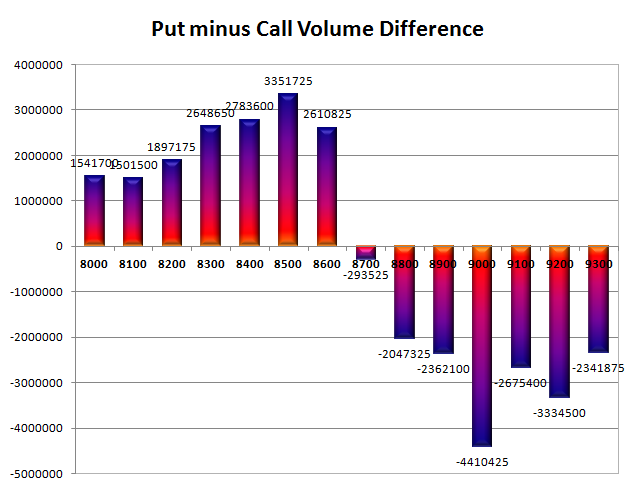 Day Range as per Option Table is 8687 - 8840 and as per VIX is 8663 - 8861 with 8763 as the Pivot. 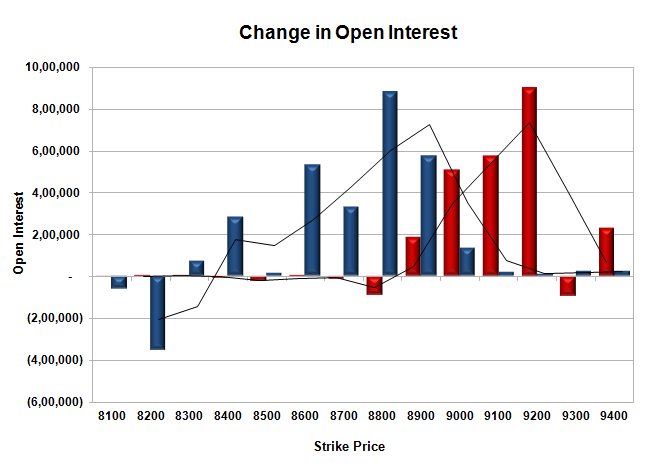 The index opened flat to positive but saw huge profit booking to the lows of the day at 8794. The responsive buyers took control from thereon to move the index back in green and above 8900 only to close a bit lower at 8895.30, gain of 26.20 points. The broader market though was negative, with 705 advances to 788 declines. 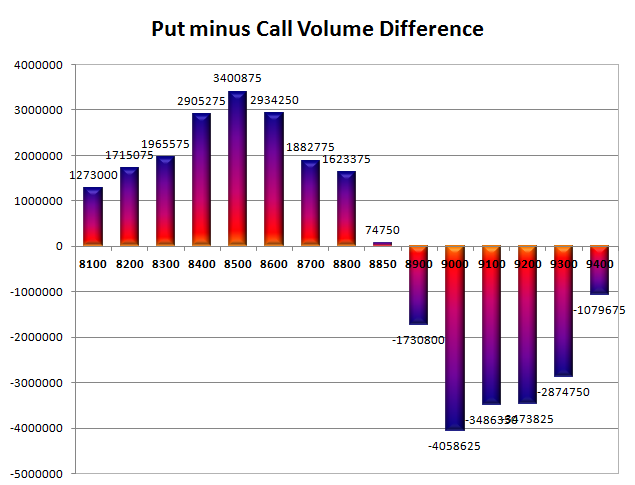 Range as per Option Table stays at 8500-9000. 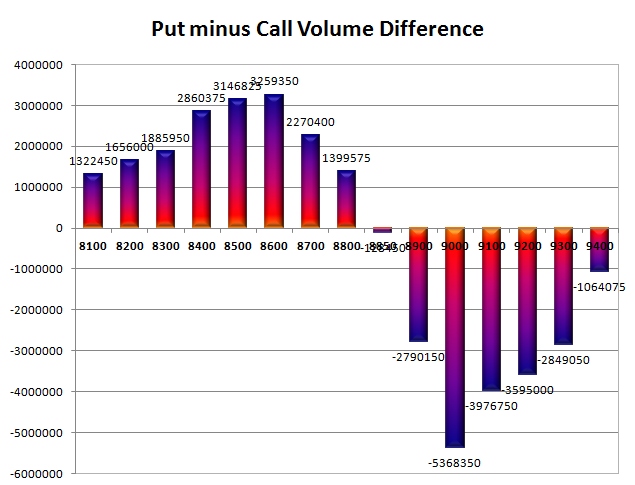 Call option 8850-8900 added 1.15 lacs OI with short covering seen at 8800 and below strike prices. 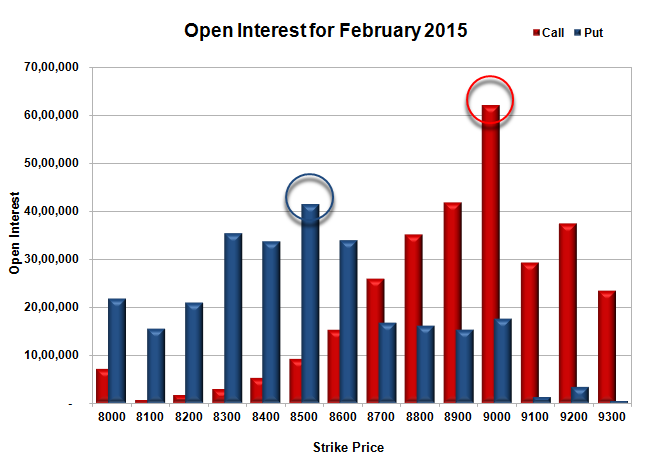 Put option 9000-8800 added huge 10.99 lacs OI with profit booking seen at 8400 and below strike prices. 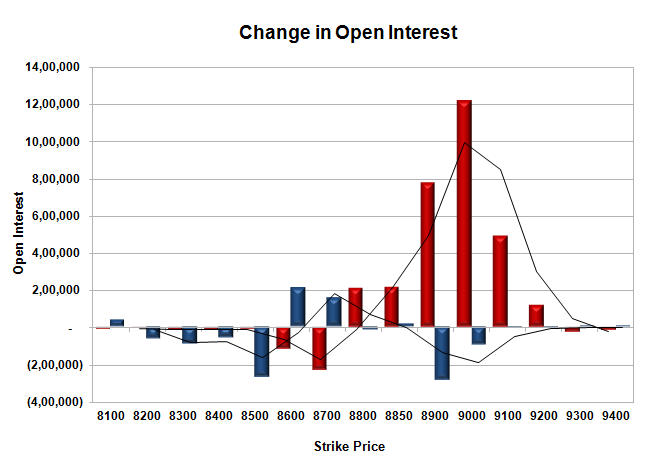 Nifty Open Interest is at 2,48,70,425 down by 6,76,775, whereas March series added 6.61 lacs with increase in price, most probably 100% rollover with small short covering. 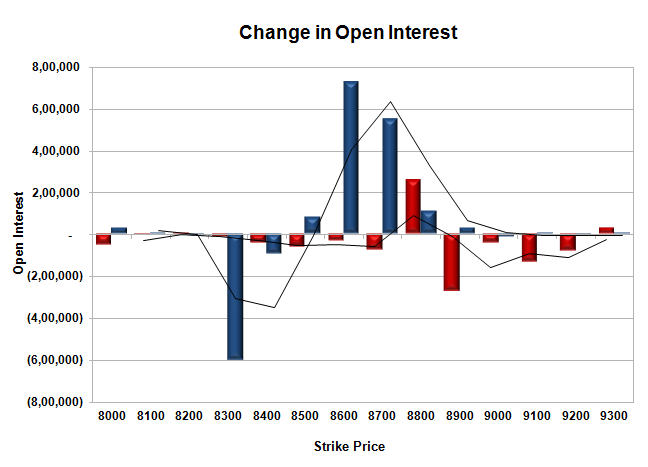 Bank Nifty Open Interest is at 21,68,625 down by 9,775, whereas March series added 0.94 lacs with decrease in price, most probably 100% rollover with huge short build-up. 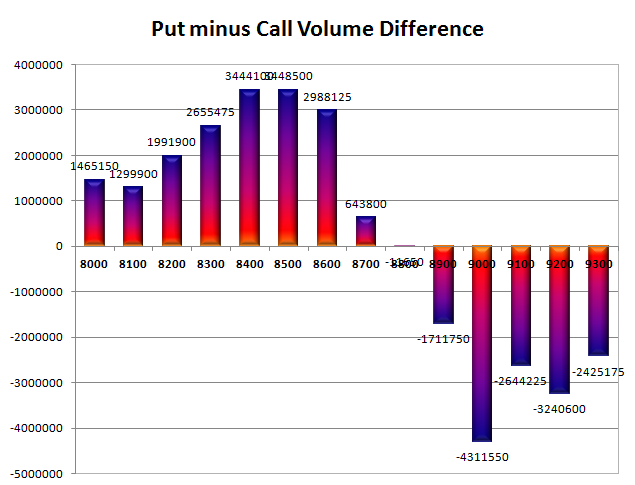 FII’s sold huge 6.16 lacs Futures, which includes 24797 contracts long liquidation and 170 contracts short covering, with decrease in net OI by 24967 contracts (includes 33629 longs to 58256 shorts for the day) and the Average Price comes to 8912.27. 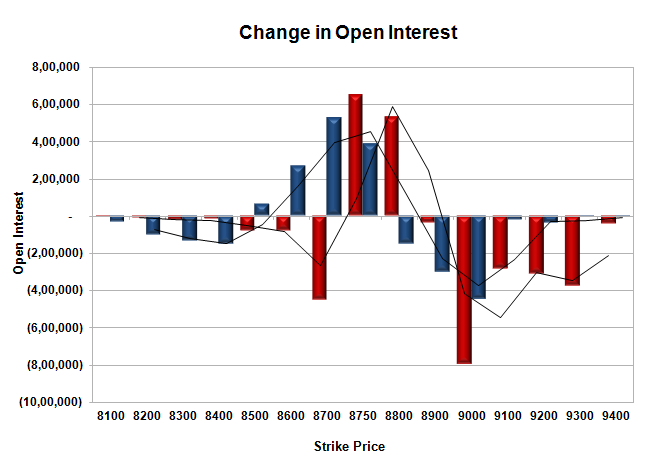 FII’s Index future open contract as on date is 754045 Longs to 114793 Shorts, net long 639252 down by 24627 contracts. 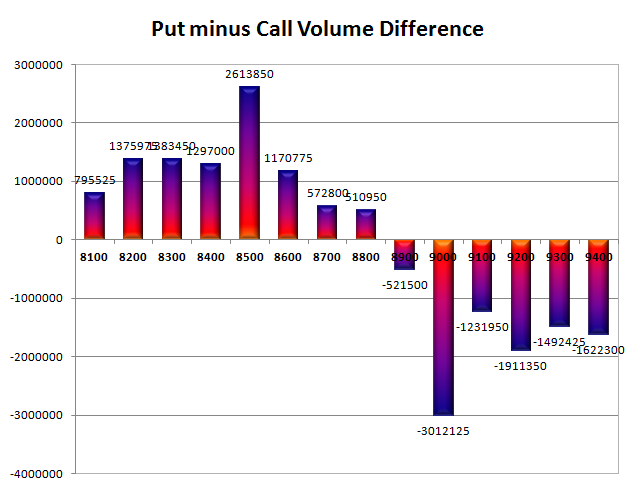 Initial and best support at 8800, with OI of 43.14 lacs and below that at 8700 with OI of 37.37 lacs. 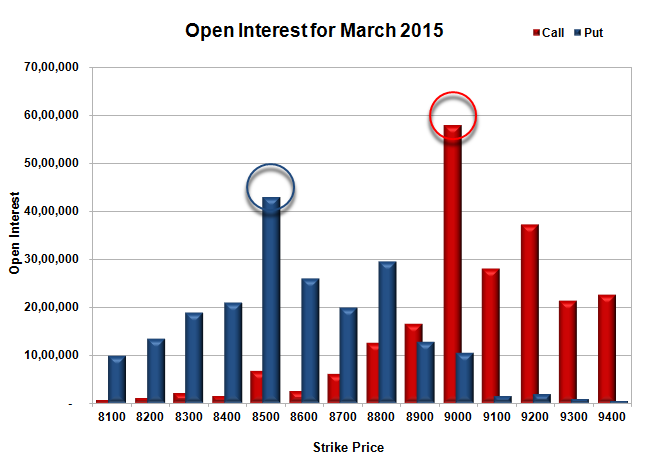 Initial resistance still at 8900, with OI of 46.27 lacs and above that at 9000 with highest OI of 60.86 lacs. Day Range as per Option Table is 8794 - 8955 and as per VIX is 8800 - 8990 with 8868 as the Pivot. The index opened strong around 8677 but saw profit booking for the first few hours of trade but saw huge buying interest around the lows to move and close near the highs at 8711.55, huge gain of 84.15 points. The broader market was strong, with 931 advances to 549 declines. 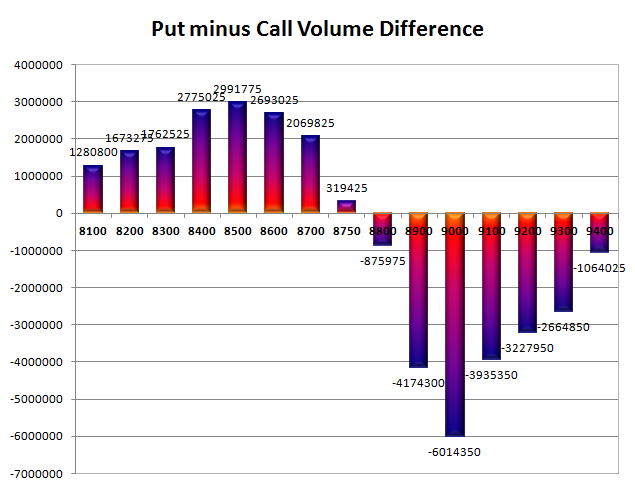 Developing Range as per Option Table narrows down to 8500-9000. 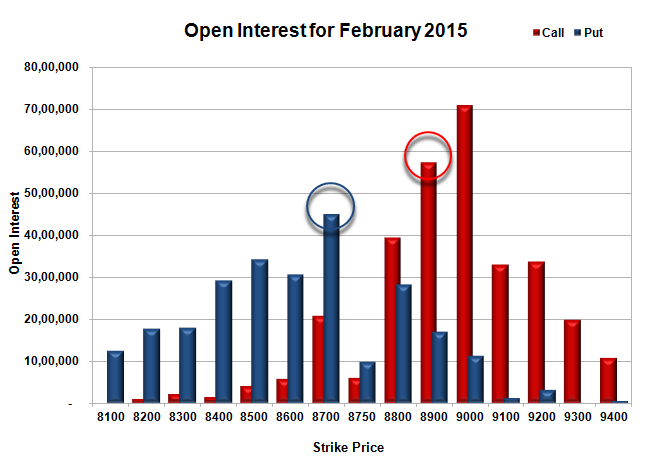 Call option 8800 added 2.59 lacs OI with profit booking seen at 8900 and above strike prices. 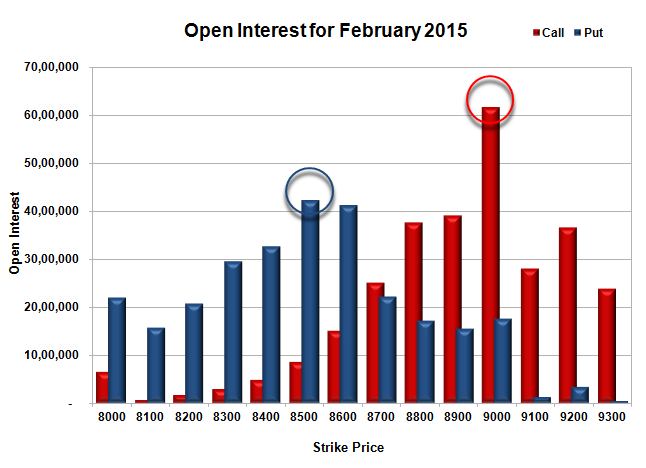 Put option 8800-8500 added huge 14.72 lacs OI with profit booking seen at 8400 and below strike prices. 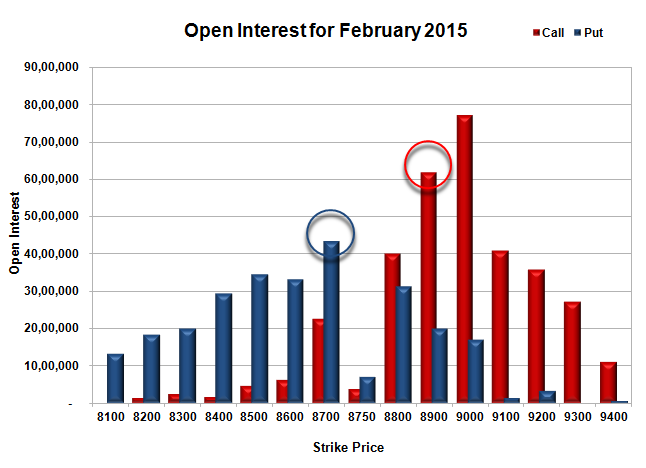 Nifty Open Interest is at 2,53,05,800 up by 4,97,500, with increase in price, most probably long build-up. 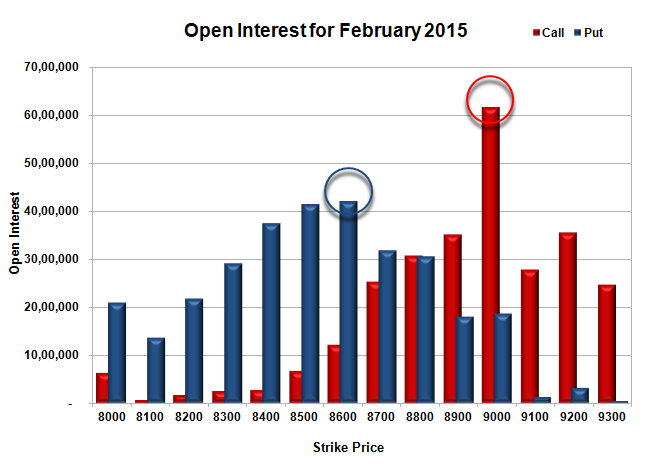 Bank Nifty Open Interest is at 21,71,575 up by 56,600, with increase in price, most probably long build-up. 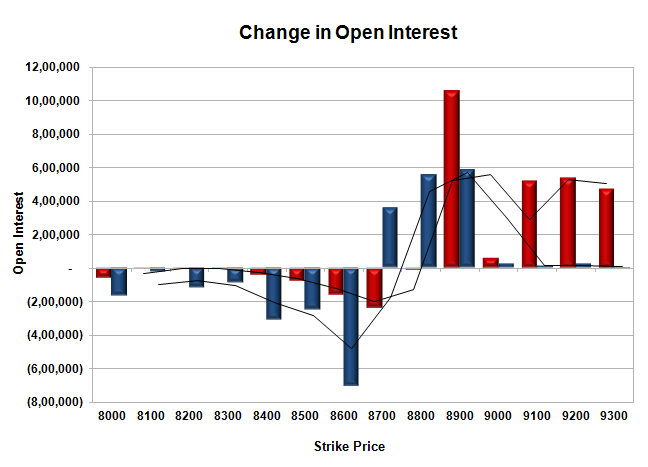 FII’s sold huge 7.10 lacs Futures, which includes 2483 contracts long build-up and 30866 contracts short build-up, with increase in net OI by 33349 contracts (includes 46525 longs to 74908 shorts for the day) and the Average Price comes to 8751.47. 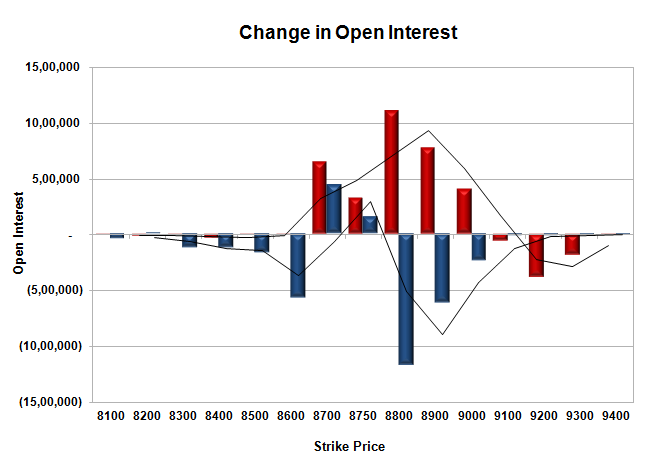 FII’s Index future open contract as on date is 730468 Longs to 155039 Shorts, net long 575429 down by 28383 contracts. Initial support getting better at 8600, with OI of 41.18 lacs and below that at 8500 with huge OI of 42.27 lacs. 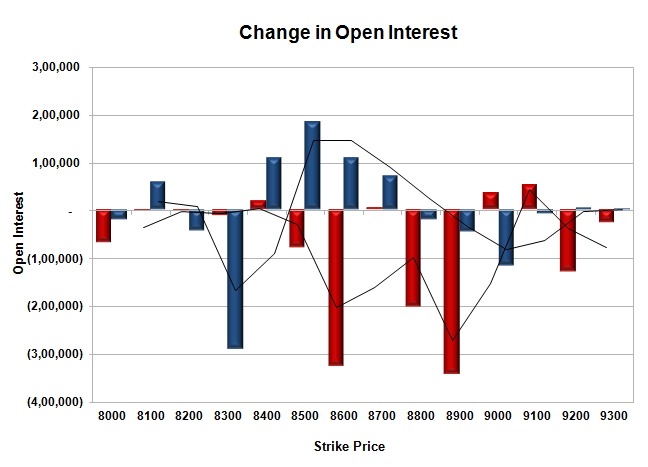 Initial resistance now at 8800, with OI of 37.67 lacs and above that at 8900 with OI of 39.19 lacs. 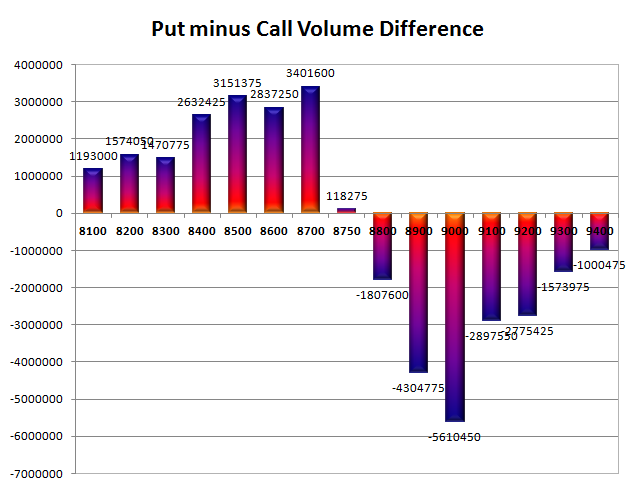 Day Range as per Option Table is 8602 - 8777 and as per VIX is 8620 - 8803 with 8681 as the Pivot.